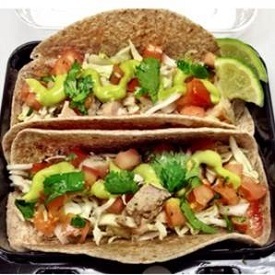 Cool off your spring and summer menu with this creamy cilantro chicken soft taco recipe developed by the California Culinary Centers for school food service menu planning. This recipe yields 80–3.7 ounce creamy cilantro chicken soft tacos: 2 per serving. Thaw chicken one to two days in advance in refrigerator. Critical Control Point (CCP): Thaw chicken in refrigerator at 41°F or below. Rinse tomatoes under cool running water. Dice tomatoes. Rinse cilantro under cool running water, drain. Remove stems and chop. Pack loosely cilantro, yogurt, lime juice, garlic, oil, salt, and sugar in blender or food processor. Blend until smooth consistency. Hold dressing in bulk and covered or portion ⅛ cup or 1 ounce ladle in 2 ounce individual cups and cover with lid in refrigerator. CCP: Hold dressing in refrigerator at 41°F or below. Lay out tortillas on flat surface. Top tortilla with ¼ cup or one number 16 scoop shredded cabbage. Top shredded cabbage with about ½ cup or one number 8 scoop or 1.8 ounces of fajita chicken. Scoop ⅛ cup or number 30 scoop diced tomatoes on top. Drizzle ⅛ cup or 1 ounce ladle of dressing or serve in 2 ounce individual cups on side. Fold soft tacos burrito style or snack wrap style. Portion 2 soft tacos in one–8 inch by 8 inch by 2 inch individual serving container or similar capacity or place in two–12 inch by 20 inch by 2½ inch pans. Cover and refrigerate until use. Note: for best quality use within 24 hours. CCP: Refrigerate tacos at 41°F or below. Serve two–3.7 ounce soft tacos per serving. This recipe yields 160–3.7 ounce creamy cilantro chicken soft tacos: 2 per serving. Yield 80 or yield 160–3.6 ounce creamy cilantro chicken soft tacos: 2 per serving. CCP: Thaw chicken in refrigerator at 41°F or below. CCP: Hold dressing in refrigerator at 41°F or below. CCP: Refrigerate tacos at 41°F or below if made in advance.